Price has been lowered again, £10 for the starter pack on PS3 at Amazon, as its £10 Free delivery is included. Starter pack includes, 3 characters(1 Giant), a portal and the game, all you need to complete the story and get a platinum trophy. Hot, ill update the prices on the mega thread i started! lol even cheaper now. ordered last week for £12 and not its only £10. Thanks ordered Was looking for the Spyro one but just went out of stock in Game as I went to order it! Thought I'd give this a bash for ten pound. There are still better deals if you don't mind second hand as you can get the game PLUS a whole set of figures on fleabay for £40-50. I got a set for £50 that would have retailed at £180 in total. It's much easier to pick up bundles that include the game than people selling just the figures. Hot for new though, but be prepared to spend a tonne extending your collection. There are still better deals if you don't mind second hand as you can get … There are still better deals if you don't mind second hand as you can get the game PLUS a whole set of figures on fleabay for £40-50. I got a set for £50 that would have retailed at £180 in total. It's much easier to pick up bundles that include the game than people selling just the figures. Hot for new though, but be prepared to spend a tonne extending your collection. Me and my mrs completed this and swap force with only the characters included, I then went back and got a platinum trophy on both on them. I'm looking forward to spyros adventure arriving from the GAME deal posted on here at £10, great fun in 2 player. You can get a platinum trophy or 100% achievements and complete the entire game/story with the 3 characters included, no need to buy more. There are small sections in the game you cant get to without extra characters but these only ever lead to upgrades in the form of hats or money/ treasure chests. 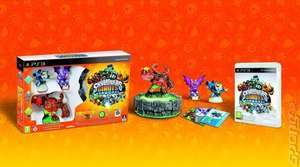 Good deal - shame you have to spend a small fortune on the other characters - Skylanders is becoming too expensive and now with trapteam out this year where you have to buy the Characters and the Trap keys ! Thanks, ordered. Would have preferred the wii u version, but at £10, can't say no to one of the older consoles ones. Looking forward to playing with my 4 year old! Good deal - shame you have to spend a small fortune on the other … Good deal - shame you have to spend a small fortune on the other characters - Skylanders is becoming too expensive and now with trapteam out this year where you have to buy the Characters and the Trap keys ! You don't according to someone who's got platinum with the 3 included characters. It's useful to have other characters mainly because during the battle sequences if your character runs out of energy you can either rest it for a while (not sure how long but seems like hours) or swap it for another. Smyths are selling them off fairly cheap, a fiver for the giant figures. Probably worth getting a couple if you want to get the most out of the game. Which is pretty good fun. £8.99 for these in HMV Edinburgh Princes Street yesterday. Buy it again at £10, then return the £10 amazon one to wherever you bought it from using their original receipt. The product barcode will be identical, and you'll be returning a sealed copy. Don't know what I've bought but it's hot and I have a PS3 so there you go! My 5yr old has been going on about Skylanders for a while, but I'm pretty sure he doesn't know what they are. Bought one to show him... and not at all because I think it looks fun myself. Cheers OP for the deal! Heat added - my lad wanted this and when we looked at CEX they wanted £30 for it - maybe an opportunity for someone to buy a few of these and cash in at CEX?! I do not need this, I do not really want this. I hate this damn site somedays. Hello. Does the Portal of power work over bluebooth powered by batteries? My PS3 is too far away for a wired connection ? No idea if I will like this or not (but assume sprog will), but it will hopefully work with the free characters I got from Game with the O2 priority moments deal ages ago! Hello. Does the Portal of power work over bluebooth powered by batteries? … Hello. Does the Portal of power work over bluebooth powered by batteries? My PS3 is too far away for a wired connection ? It's a wired connection, sorry bud, the original game, spyro's adventure was wireless but the portal is not compatible with newer versions of the game. The cable is around 2m long, you could always invest in a usb extention lead, few quid on ebay/amazon. It's a wired connection, sorry bud, the original game, spyro's adventure … It's a wired connection, sorry bud, the original game, spyro's adventure was wireless but the portal is not compatible with newer versions of the game. The cable is around 2m long, you could always invest in a usb extention lead, few quid on ebay/amazon. Pick up Eruptor, Prism Break, Chill and Sprocket for £2.50 each. Certainly cheaper than Disney Infinity, which my kids have got bored of already.